If a ball is out of bounds, the player must play a ball, under penalty of one stroke, as nearly as possible at the spot from which the original ball was last played (see Rule 20-5). 1886: The term out of bounds was first defined by Royal Isle of Wight, with a penalty of stroke and distance. 1899: Defined as being outside the recognised boundaries of the course; penalty distance only. 1908: Redefined as all ground on which play is prohibited. Penalty distance only still, but may be changed to stroke and distance by Local Rule for both forms of play. 1920: Stroke and distance, but now the penalty stroke may be remitted by Local Rule. 1947: USGA (1950: R&A): Distance only, and no provision for change by a Local Rule. 1960: USGA experimentally changed to distance only. 1961: USGA back to stroke and distance. In addition, the USGA allowed an alternative procedure of stroke only, dropping a ball within two club lengths of where the ball went out of bounds, on courses where the penalty of stroke and distance would be "unduly severe". 1964: USGA allowed a Local Rule to be adopted which allowed a stroke-only option if it was felt that stroke and distance would be “unduly severe”. The player could drop a ball within two club-lengths of where the original ball crossed the out of bounds line. Reasonable evidence was required both that the ball had gone out of bounds and as to the point of crossing. In the absence of either, stroke and distance was the only option. The main difficulty relating to a ball that has come to rest out of bounds is estimating where it last crossed the boundary of the course. Sometimes this may be easy to determine, as in the photo above, but more often it may lead to robust debate between players, officials and spectators. Also, there is little doubt that keeping the ball within the boundaries of the course can be a strategic part of the challenge of playing some holes. This is particularly true on courses that have tight boundaries where some holes have specifically been designed to encourage players to weigh the risk-reward of a shot and play the higher percentage route for safety. In this context, safety may include both avoiding out of bounds penalties and avoiding public liability issues from balls landing outside the course. 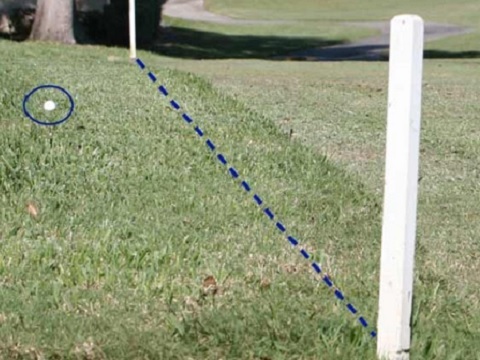 Adjusting the penalty for balls played out of bounds could lead to players choosing to take high-risk shots towards, or over those areas, with little concern for what is on the other side. Presently, there is no change in the ‘Draft New Rules of Golf for 2019’ with respect to what to do when a ball is lost or out of bounds; “18-2b: If a ball is lost or out of bounds, the player must take stroke-and-distance relief by adding one penalty stroke and playing the original ball or a substituted ball from where the previous stroke was made.“ However, I would not be surprised if serious representations are made from some quarters to treat out of bounds area the same as ‘red penalty areas’, for which there will be similar relief options to that for lateral water hazards in the current Rules. If your golf club is anywhere in Ireland, Berkshire & neighbouring counties in England, or Aberdeenshire in Scotland, why not suggest a Rules of Golf social evening to your Committee. I am widening the areas where I give presentations and would be pleased to quote them for an evening’s ‘entertainment’! I would imagine that almost 100% of non-tournament play in the US treats OB as a red hazard if no provisional was played, since no one wants to go back to the tee, especially on a busy course with aggressive marshals. Going back to the tee is guaranteed to annoy the group behind you, as well. I am sure that you are wrong with your wild 'guesstimate'. This practice would definitely not be permitted in a any competition run under USGA Rules and would not be acceptable for handicapping purposes. "I am a party to an effort which strongly encourages some additional movement on this issue by the Joint Rules Committee. Primarily, the USGA must first recognize this is much more of an issue for the vast majority of none professional players, particularly with a lost ball. Players on the tours rarely lose a ball primarily because there are so many eyes and or cameras on the ball. The typical amateur frequently finds they lose a ball “in plain sight” for no good reason other than it is not readily visible or not located in the area players are concentrating their search. Now, take away 40% of the authorized five minute search time, and you have compounded the problem. The JRC effort has already shown a willingness to further adopt the concept of a second penalty stroke (first with R26-2, and probably in the future for a ball unplayable in a bunker). It is our contention that for both a lost ball and a ball found out of bounds, neither of which at the time did the player feel it necessary to play a provisional ball, that the player be offered and alternative way to proceed other than return to play a ball under penalty of stroke and distance. The idea is to initially do this under Local Rule, get a good feel for how well received it is and gain some data for further analysis before proceeding. If all goes well and proves successful, the JRC could adopt this into the body of the Rules and then offer a Local Rule which would withdrawal the second penalty stroke option for more elite events as the exception. The four Rules: water hazards, unplayable, lost and OB, all provide the player with relief options when it becomes clear he cannot continue play of the hole by simple adherence to the two prime principles of our game. The options available to the player for how to proceed under ball lost or OB should be expanded to offer as many similar solutions as is possible. Hopefully, there is still open-mindedness regarding this topic. I think the key to proceeding with this concept, is nailing down where the player is permitted to put another ball into play. We solve that, and I think we eliminate a major barrier for progress." I look forward to seeing how this is received by the JRC, as it appears to me to offer an innovative and equitable resolution to a difficult issue. It is always pleasing for me to hear from those that find my content interesting/useful. If you do have any unresolved incidents on which I can provide an authoratative opinion, please feel free to email them to rules at barry rhodes dot com. When you didn’t know it was going to be lost and didn’t hit a provisional and it’s a busy course where you can’t go back, what are you supposed to do for handicap purposes? Take the most likely score on the hole like the rules say when you don’t hole out a putt like in conceded putts in match play situation? Or is the whole round no longer under the rules of golf and not to be posted? I’m in the US and I can’t say I’ve ever seen anyone go back to the tee for a lost ball or OB situation in casual play. In tournaments obviously yes, then it is enforced properly. Some busy places in casual play have marshals riding you so hard that you don’t even want to hit a provisional out of concern it will take away from time to look for your original so that’s a factor…you don’t always get your 5 minutes in casual play either. As long as I’m on that topic, changing the time to look for a ball from 5 minutes to 3 minutes will make the discrepancy in lost balls between tournament play and causal play even worse. That is the one rule I’m very much against changing. If anything I’d like to see the discrepancy narrowed, not widened. I do not have any expertise on handicapping systems, which vary considerably around the world. However, I can assure you that the only way to proceed if you cannot find your ball within the permitted time, and a provisional ball has not been played (why? ), is to return to where you last played from under penalty of stroke and distance. Failure to do so incurs the penalty of disqualification in a strokes competition, disqualification from the hole in a Stableford competition or loss of hole in match play. The Rules of Golf are the same for casual play as for competition play; if you are not following these Rules you are not playing golf! Personally, I do not agree with you on the proposed change to reduce the time to search for a ball from 5 minutes to 3 minutes, but you should use the current opportunity to advise the USGA/R&A of your views before they finalise the modernisation of the Rules for January 2019. Hope you understand I'm not trying to be antagonistic, just expressing a few minor frustrations I have. The point I'm trying to make is there are scenarios where you didn't know it might be lost and the course managers and other groups playing don't want you holding up play by following the letter of the rule. That's a real problem and thus I welcome solutions like your US subscriber mentioned. It's rare if you're hitting provisionals like you're supposed to but even then still not non-existent. If we're trying to speed the game up with these rule changes then stroke and distance seems like an obvious one to me. Even hitting a provisional adds time when you're walking because you have to go chase down two balls now. I wouldn't have a problem with the rule the way it's written today if it weren't for others pushing/in a hurry. I am in no hurry to get off the golf course. I want to be there. I don't like feeling like I'm holding people up though. As far as the search time rule it's just a gut feeling, not something to submit to the R&A/USGA. Real research would be something to submit, or the R&A/USGA should do it themselves. (if it exists I'd love to see the data). If data shows in casual play balls not found in the first 3 minutes are hardly ever found in the last 2 then the change makes sense. A player(thought his fisrt tee shot might be out of bound) played a provisional ball with a 3 wood out side teeing ground and went for searching. So the ruling is, he must play original ball if it was in bound. And if it wasn't, he's in breach of rule 20-5/a for playing provisional ball from outside teeing ground. As it was not a serious breach(my opinion), he may play the provisional ball from where it lay. He incurred strok and distance penalty and additional 2 strokes penalty for breaching rule 20-5/a. Is that correct ruling,Sir? No, in stroke play, if the original ball was out of bounds the player must play another ball from within the teeing ground. As the provisional ball was played from outside the teeing ground the player must correct their mistake by playing their 5th stroke from the teeing ground before making a stroke from the next teeing ground. If they did not do so, they are disqualified for a breach of Rule 11-4b. It is not a Rule 20-5a(?) or even a Rule 20-7 breach for playing from the wrong place. Could you please explain me what would the siturations that are in breach of 20-5,Sir? Under Rule 27-1, a player may always choose to play a ball as nearly as possible at the spot from which their original ball was last played from for a penalty of one stroke. When they choose to do so they must follow the requirements of Rule 20-5, depending on where their last stroke was played from; (a) on the teeing ground, (b) through the green, (c) in a hazard, (d) on the putting green. So, for example, if a player's last stroke was from the fairway and they choose to play again from that spot under penalty of stroke and distance, they would be in breach of Rule 20-5 if they placed a ball there instead of dropping it. If a player's last stroke was from teeing ground and they choose to play from the teeing ground under penalty of stroke and distance,what would be the situration that is in breach of rule 20-5,Sir? Frankly, I cannot think of any instance of a breach of Rule 20-5a. However, a player cannot complete a hole without making a counting stroke from the teeing ground of that hole, which is why it is my opinion that Rule 11-4b applied in your scenario above and not Rule-20-5. The only instance I can think that is in breach of 20-5/a is playing from outside teeing ground. As 11-4 is applicable, I might say 20-5/a is not necessary.What would you say about that,Sir? You are really labouring this! The penalty is for any breach of 20-5, which has four parts, (a), (b), (c) and (d). As we have discovered it does not apply to (a), because of Rule 11-4b, but it would be confusing if this Rule did not include the teeing ground, especially as Rule 27-1 refers to it. If a player placed a ball instead of dropping it and played it, whether they penalized under rule 20-5 or rule 20-7,Sir? This is my last response to your fixation over this Rule and my answer is that it depends entirely on the circumstances. For example, if a player has played from the teeing ground and chooses to play under penalty of stroke and distance, Rule 27-1, there is no penalty if they drop or place their ball on the teeing ground, Rule 20-5 (a); if they are proceeding under Rule 20-5 (b) or (c) and they place a ball they are penalised for a breach of Rule 20-5; if they are proceeding under Rule 20-5 (d) there is no penalty for placing the ball on the putting green. However. if they are taking relief without penalty from an immovable obstruction or an abnormal ground condition and they place a ball instead of dropping it, they are in breach of Rule 20-7.